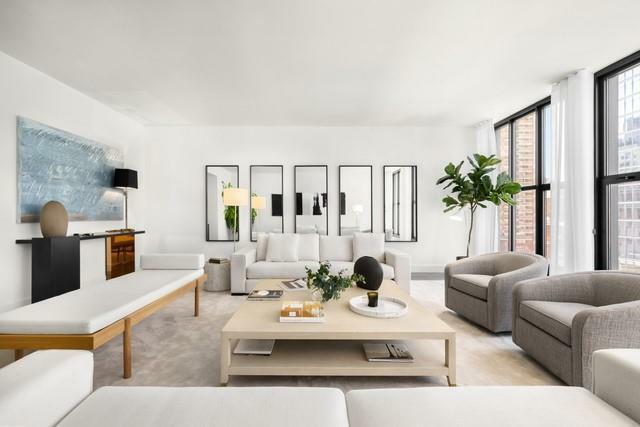 Located in a peaceful oasis of TriBeCa, this brand new five-bedroom home offers 4,176 square feet of interior space and three private terraces. Designed by acclaimed architect Morris Adjmi, this unrivalled penthouse showcases interiors customized by Stefano Pasqualetti. Described as "soothing and timeless" when featured in DEZEEN magazine, the rich finish palette references the iconic window frames of the building's facade. Arrive via keyed elevator to each of the four floors where the stage is set for bright and airy living spaces ideal for both lavish entertaining and serene everyday living. On the lowest level are three bedrooms, all complete with ensuite bathrooms. The bright and spacious west-facing master suite is privately tucked away in its own wing, offering two large walk-in closets and a sumptuous master bath. Exquisite finishes of the five-piece bath include radiant heated lava stone floors, Carrara bamboo marble walls, integrated Pietra Serena double sink with walnut vanity by GD Cucine, standup shower, and separate deep-soaking tub.Upstairs, the second level features a living room of grand proportions plus two more bedrooms and full bathrooms. The great room encompasses almost five hundred square feet of entertainment space facing west with floor-to-ceiling windows. On the third level, the beautifully equipped open Chef's kitchen stands ready to accommodate lively dinner parties or quiet family meals. Designed by GD Cucine, finishes include Italian Maroon Marinace marble countertops and backsplash, satin glass and walnut cabinetry, Wolf gas oven range with vented hood, Wolf steam oven, Wolf drawer microwave, Miele dishwasher, and a 46 bottle SubZero wine refrigerator. On the opposite end of the floor, an expansive dining area fuses with the lush private outdoor space to create the perfect indoor/outdoor entertainment atmosphere. Also located on this level is a powder room. The top floor offers a fifth bedroom or den area, a full bathroom, and two additional private terraces. The east-facing views offers extraordinary unobstructed views to the south of the Freedom Tower, and the west-facing terrace offers unobstructed views to the north. 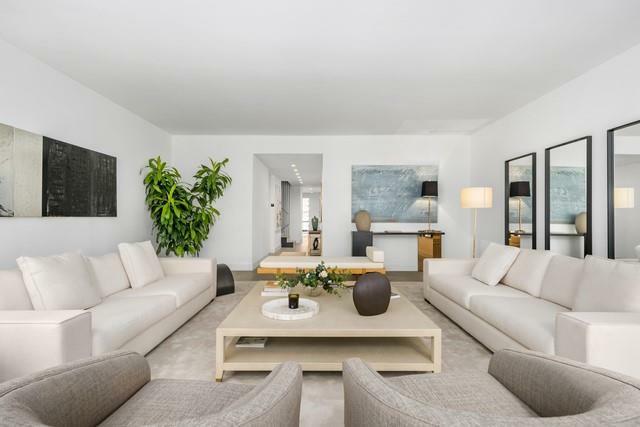 This townhouse in the sky is flanked with a sculptural staircase in blackened steel, marble and oak, and features seven-inch wide plank Italian oak floors in a "dark sand" hue, central air conditioning, and a vented professional series Maytag washer & dryer. 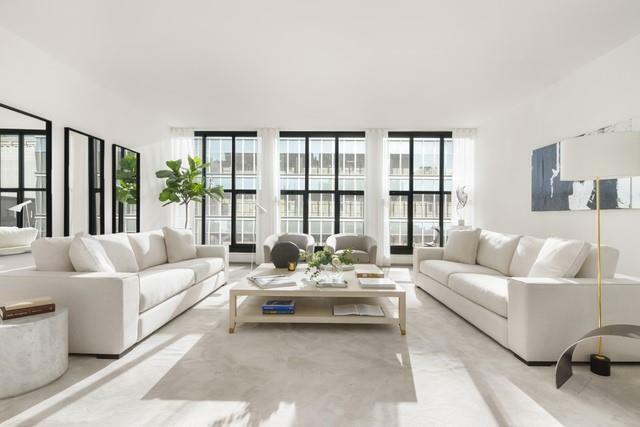 403 Greenwich is a brand new boutique condominium positioned on a coveted TriBeCa block between Beach and Hubert Streets. The exclusive new development is comprised of just three duplexes and one Penthouse, promoting an intimate environment. Amenities include a private keyed elevator and virtual doorman.